The square Ultrovent® air brick ventilators are the ultimate in controlled passive ventilation. The unique triple action filter helps to reduce condensation, noise transmission and heat loss through the ventilation duct. At the heart of the Ultrovent® filter is a thermal core that promotes the movement of damp air out of the property. The cavity liner is constructed from High Impact Polystyrene (HIP) to reduce cold bridging and provide increased strength and resistance to distortion. Installation of the Ultrovent® Air Brick Ventilator requires a 225mm x 150mm (double air brick) sized hole. The Ultrovent® Air Brick Ventilator can accommodate a wall thickness up to 350mm. Note: Ultrovent air brick ventilators are NOT designed to be used in a kitchen or bathroom in place of an extractor fan. for more guideance, glossary of terms, inspiration & advice and other information, please browse our website or feel free to contact us. 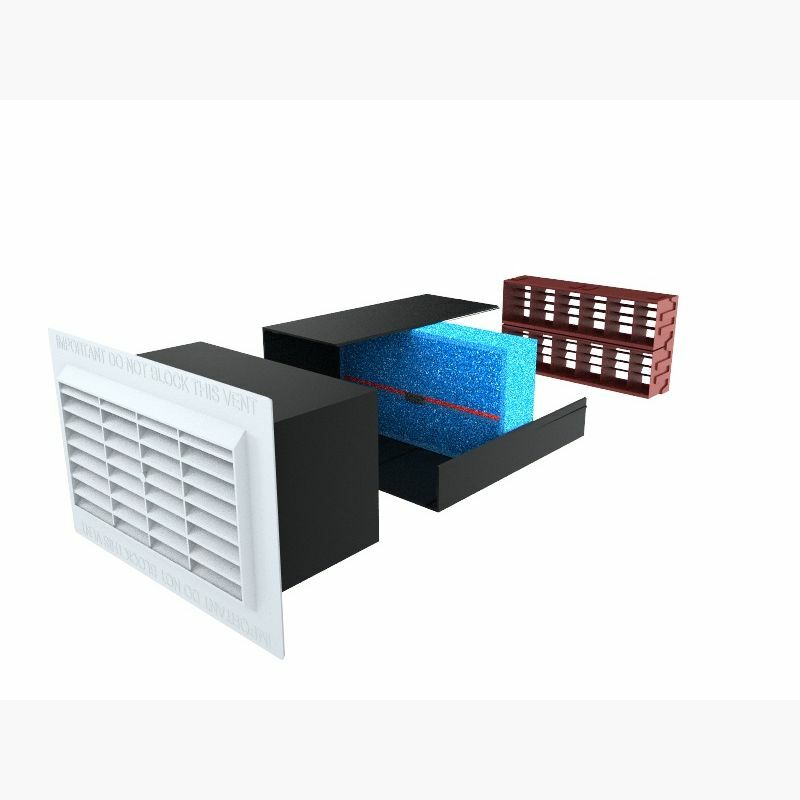 The Ultrovent® air brick ventilators are the ultimate in controlled passive ventilation. The unique triple action filter (patent pending) helps to reduce condensation, noise transmission and heat loss through the ventilation duct. The Ultrovent® Air Brick Ventilator can accommodate a wall thickness up to 350mm using its telescopic extension feature. Extension kits are available for walls of greater thickness. DIY: Retrofitting to existing hole: 45 minutes. Creating and installing into a new hole; 1 day. Professional:Retrofitting to existing hole: 30 minutes. Creating and installing into a new hole; 3/4 day. Below is a step-by-step guide on how to install the Ultrovent Airbrick Ventilator, for a download of this click here. 6. Insert internal grill into the cavity liner. 1. Choose a suitable location for the Ultrovent. Installation should be through an external wall towards an upper or lower corner of the room. 2. Create a suitable aperture through the wall. 3. Place filter into the centre of the cavity liner. Red strip uppermost and label visible from inside the room (White grilled casing showing inside the room). 5. Position Ultrovent through the wall aperture. air brick to finish flush with external brickwork and pointed as necessary. Seal liners together with mastic if required. Push white grill firmly against internal plasterwork. Clean filter with a damp cloth and replace every 2 years. To purchase replacement filters for the Airbrick Ventilator click here. By combating damp, you don’t have the costs of fixing it. Uses no power to run. Filter easily removes for cleaning/replacing. Standard airbrick size so retrofit with ease.